LaLiga will now be known as LaLiga Santander and LaLiga2 as LaLiga 1|2|3 for the next three seasons. LaLiga and Santander have announced a strategic sponsorship agreement, signed today in Madrid, that will couple two of the most important brands in the world for the next three years, with the option of another year. Through this agreement, the Spanish top flight will now be known as LaLiga Santander, and LaLiga2 as LaLiga 1|2|3, alluding to the 1|2|3 account offered by the bank, central to the company’s commercial strategy in Spain. With this partnership, LaLiga has achieved its aim of associating itself with a brand that possesses national and international prestige. The bank boasts 121 million customers, with a presence in Spain as well as other European markets (the United Kingdom, Germany, Portugal and Poland), Latin America (Brazil, Argentina, Mexico, Chile etc.) and the United States. The terms of the contract include advertising presence for Santander both during broadcasting of LaLiga Santander and LaLiga 1|2|3 matches and in stadiums, as well as the development of joint digital strategies, databases, ticketing policies and experiences related to football, and association and image rights. 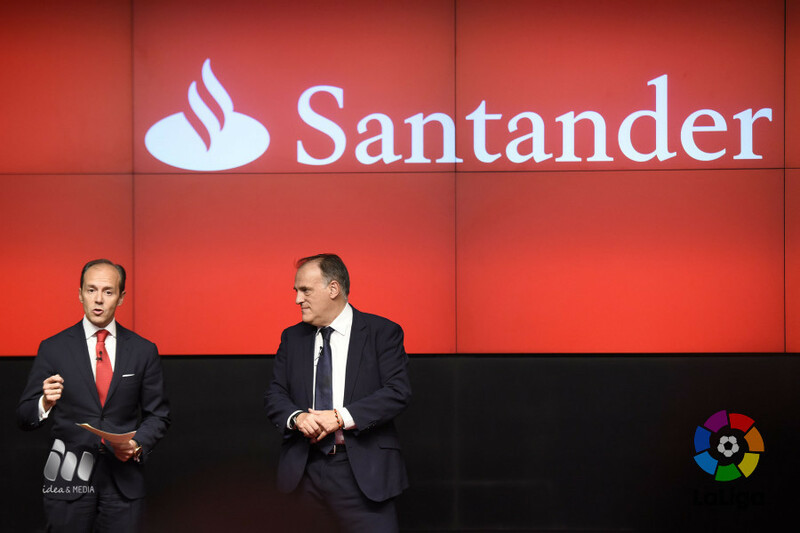 During the presentation, the general manager of Banco Santander and country head for Santander Spain, Rami Aboukahir, emphasised the importance of the tie-in with what he described as "the best football league in the world, our national league." On this note, he stressed that this partnership will boost the bank's branch network in Spain and highlighted Banco Santander's ongoing commitment to the beautiful game, with which the company shares values such as "passion, approachability, effort, embracing talent and teamwork." 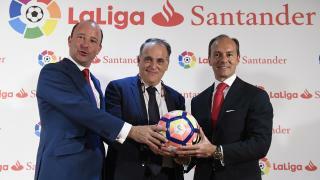 LaLiga President Javier Tebas said: "Banco Santander has what we were looking for. We were looking for an organisation to help us with the internationalisation we're lacking. We wanted a partner that wouldn't pose a reputational risk and that would comply with good governance standards. Also, one that would fulfil corporate social responsibility. It's impossible to avoid talking about the financial issue, but when we made the decision, money wasn't the important thing. Today we want to be close to those who will help us grow and continue to be the best league in the world, just like Banco Santander is the best bank in the world. From now onwards, LaLiga will always be red hot." Santander has been sponsoring football competitions in Latin America for the last eight years, becoming one of the brands most associated with the sport in the region. It is currently the official bank of the Copa Libertadores, Latin America's equivalent of the Champions League, and it also runs numerous local sports sponsorship and promotion activities.